Bananas are one of the most popular fruits in the United States, with more than 6.4 billion pounds consumed each year, according to Pacific Lutheran University. If you enjoy eating bananas, but are looking for some variety, consider trying red bananas. They have the flesh of the yellow banana with a raspberry-banana flavor. 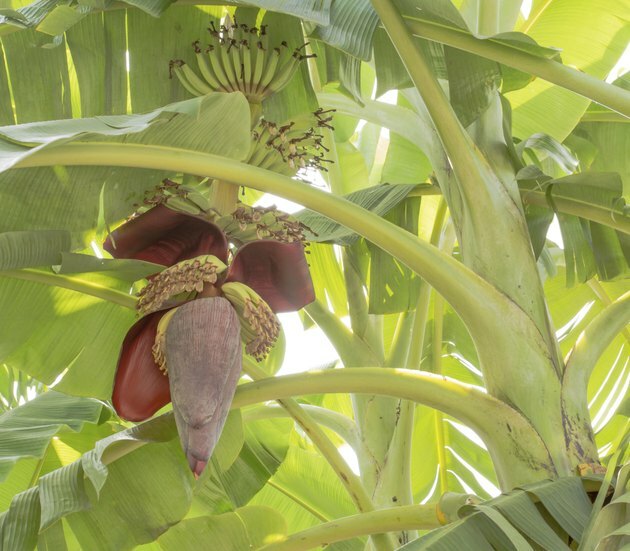 Red bananas offer a number of health benefits, making them a good addition to your diet. Like all fruits, red bananas make a low-calorie addition to your diet. One medium red banana contains just 110 calories. Including red bananas in your diet can help fill you up without costing you too many calories, making it easier to stay within your daily calorie budget for weight maintenance. Red bananas can help you meet your daily fiber needs. One medium red banana has 4 grams of fiber, meeting 16 percent of your daily value for fiber. Fiber is a type of carbohydrate your body cannot digest. Women need about 25 grams of fiber a day, and men need 38 grams a day. Because you cannot digest it, fiber slows the digestive process. This helps keep you feeling full longer and helps with weight control. In addition, including more fiber-rich foods in your diet like the red banana can lower your risk of heart disease and type 2 diabetes. The red banana is a good source of potassium. One medium banana contains 400 milligrams, meeting 11 percent of your daily value. Potassium is a mineral and electrolyte. You need adequate intakes of potassium for fluid and electrolyte balance. You also need potassium for heart function, muscle contractions and digestion. The American Heart Association recommends you include more potassium-rich foods in your diet because it may help lower blood pressure levels. High-potassium foods, however, are not safe for everyone. If you have a history of kidney disease, you may need to limit your intake. Talk to your doctor about your daily potassium needs before increasing your intake. Vitamin B-6 is a water-soluble vitamin needed for protein metabolism and red blood cell metabolism. You also need it to make hemoglobin, the protein that carries oxygen throughout your body. Poor intakes of vitamin B-6 can lead to anemia. Including red bananas in your diet can help you meet your daily needs. One medium red banana meets 20 percent of your daily value for vitamin B-6. The red banana is also a good source of vitamin C, meeting 15 percent of your daily value. Vitamin C is another water-soluble vitamin important for growth, immune health and collagen production. Vitamin C is also an antioxidant that offers protection against free radicals, which may help reduce your risk of heart disease and certain types of cancer. How Much Iron Is in Bananas?